Continuing our series of articles highlighting the technical diving experience and expertise of PADI staff, this month is all about Karl Shreeves. Karl Shreeves, PADI Technical Development Executive, was first certified as a young teenager in 1970. Passionate about diving, he has stayed close to diving his entire life, entering tec diving in 1992 when he was invited to join the second and third Farb Monitor Expeditions. At the time, divers only visited the famous shipwreck under special permit to conduct archaeological research. By the mid 1990s, Shreeves was active in deep trimix diving and cave diving. 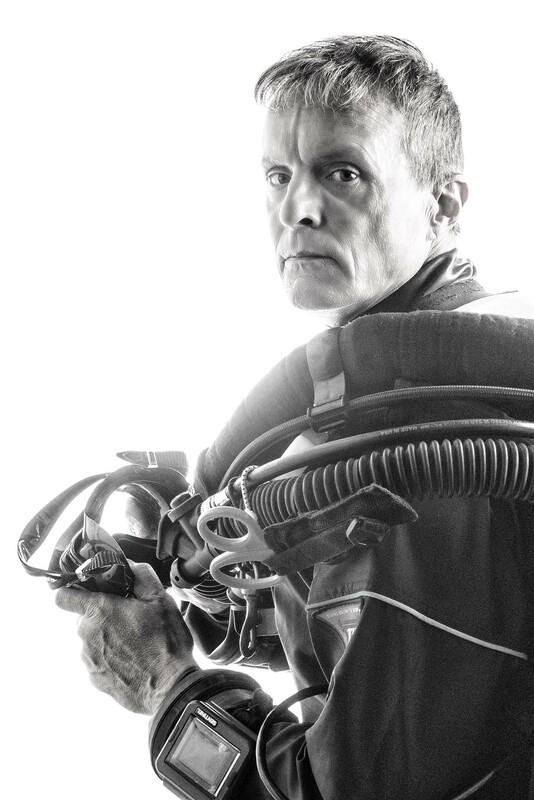 During Project Nohoch 1996, he began exploratory cave diving in sidemount, long before the configuration became commonplace. Over the next three years, he was part of exploration of what was at the time the world’s longest underwater cave, Nohoch Na Chich on the Mexican Riveria. During the same period, he was involved in deep gas cave diving in Missouri, USA. He has both the Abe Davis and Wakulla Awards for 100+ safe cave dives. Beginning in 2000, Shreeves became (and remains) active with the Cambrian Foundation. The Foundation explored Sistem Camillo 2000 to 2006 (more 30,000 feet of passage), with Shreeves, more than once, exploring and mapping more than 1000 feet of new cave in a single (very long!) dive. In 2006, the Cambrian Foundation assisted NOAA with a sonar head recovery in 270 feet of water on the Cortez banks; Shreeves and PADI’s Steve Mortell executed the recovery dive, which as the time was the deepest scuba dive ever carried out under NOAA auspices. Shreeves has also participated with the Cambrian Foundation’s research and educational outreach in Bermuda, conducted at the invitation of the Bermudan government. The Cambrian Foundation is presently conducting groundwater quality in Florida by sampling bacteria in very small cave using sidemount and no mount techniques. In 2001, Shreeves was invited as a contractor for the first NEEMO (NASA Extreme Environments Mission Operations) mission. The 17 missions to date study human space flight dynamics in the Aquarius underwater habitat off of Key Largo, Florida. The missions involve teams of three astronauts and a NASA scientist in saturation, with research including remote medical technologies, planetary and asteroid exploration techniques, center of gravity studies for astronaut suits on the moon and Mars, and time-delay interactions with mission control. Shreeves’ roles over the years has included principal investigator for Detailed Test Objectives, trainer, support diver and photographer. Keeping pace with the rise in rebreather technologies, Shreeves is one of only a handful of people who has participated in all three of the Rebreather Forums. He is certified to dive the Atlantis/Dolphin, Sentinel, Evolution and PRISM I, and has experience on the Cobra, Optima, Cislunar III and IV, Poseidon Discovery and Carleton 15.5, and was closely involved with the development of all the PADI Rebreather and Tec CCR courses. With Drew Richardson, Ed.D., Shreeves has participated in, and presented at, multiple scientific diving workshops, including the AAUS Repetitive Diving, Reverse Profile and Deep Diving workshops, as well as the DAN Nitrox and Dive Fatalities Workshops. A PADI Course Director and TecRec Instructor Trainer, Shreeves involvement in developing TecRec programs extends beyond his diving expertise. He has a master’s degree in instructional system design theory. His background includes surface and underwater commercial, portrait and educational imaging and writing. His dozens of photo, writer, editor and columnist credits include Skin Diver Magazine, Sport Diver, The Undersea Journal, SPUMS Journal, and Undersea and Hyperbaric Medicine to name only a few. Previous PostPrevious Why CCR & Why now – a student’s perspective on CCR training generally and Tec 40 CCR in particular: Warrick McDonald.